BE HERE TAO: My life with Qigong and Tai Chi By Pat Gorman (May 2018) | Tai Chi Foundation Inc. Growing up in a blue-collar neighborhood in Queens in a first-generation immigrant neighborhood - Italian and Irish - all the parents were invested in having their kids fit in and become "American". American language, sports, movies, ideas, behavior. Meditation, self-examination and exploring consciousness were not even on the horizon. Fortunately my father's Native American background brought a different perspective into my life growing up, as he taught us Lakota dances and songs behind the high hedges he grew around our property. After he passed away in the 70s, I searched for these perspectives and found them in Asian studies. I read the Tao te Ching - a book of great wisdom, and studied Tai Chi - the inner spiritual practice of graceful moves that heal the body and elicit higher states of consciousness. Tai Chi consists of a long "round" of ever-changing movements which support our inner energy and organ systems. It was in Vermont that I first saw Tai Chi. A storm was coming up on the lake. A woman was doing these moves smoothly, sometimes balancing on one leg, as the dock was moving up and down. I watched, enchanted. I had to learn this! Back in the city, I searched for a teacher and fortunately found the tradition of Professor Cheng Man Ching and worked with his wonderful Senior teacher, Patrick Watson, who created the international School of Tai Chi Chuan and the Tai Chi Foundation. After 40 Years of learning and teaching this wonderful art, I became ill, crippled from a genetic illness, and I could no longer do the full Tai Chi form or engage in Push Hands, the nonviolent martial arts practice, based on getting out of the way of force. My saddest moment was losing the ability to do the sword form, which feels almost like galloping on horseback, or flying as you leap in the air, the sword flung outward as you turn and extend. Brokenhearted, I turned away from Tai Chi, remembering the Qigong moves and postures which I saw Professor Cheng teach to sick patients. Qigong is different from Tai Chi in that each move has a specific healing energy. One might be for the heart's energy, one might be to strengthen bones. And they are all breathing meditations, which reduce stress and connect us with our inner spirit. It was amazing that I could do these postures and moves, healing and strengthening slowly. I fell in love again, this time putting together a system from these moves with Gerrie Sporken, based on the Chinese medical principles studied while becoming an acupuncturist. I started a local class with Tina Curran and Steve "Tuna" Flores, my husband, at the Sag Harbor/ Bridgehampton Meeting House, to share this gift. Seeing how effective this system was, we wanted it to be available to everyone. 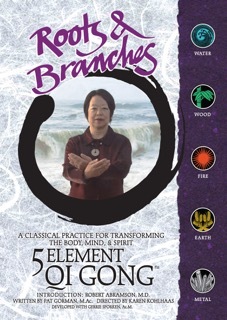 So a beautiful DVD, 'Roots & Branches 5 Element Qigong', was created, the moves demonstrated by talented senior teachers, and which people all over the world can order from the TCF or Internet. The very first Qigong move is called "Embracing the Tao", embracing the everything, all that is. When I lost Tai Chi and embraced Qigong, I found a new gift to share. And we keep finding new ways to share it . We've started an international series of Qigong "tunings" that take less than 10 minutes a day, which we do together all over the world. They are connected to seasonal energy, and tune us in to the powerful Qi available in nature. The next one starts June 21 and celebrates the fire of summer. Anyone can join. They are free, transformative, and everyone is welcome. So if you are not on the list, add yourself by going to the website and joining our mailing list. www.taichifoundation.org When the invitations go out, come and join us - no experience necessary. Pat Gorman is a senior teacher and Legacy Holder with the Tai Chi Foundation. ® T’ai Chi logo and the name Tai Chi Foundation, and School of T'ai Chi Chuan are registered Trademarks of T’ai Chi Foundation, Inc.